What One District's Data Mining Did For Chronic Absence : NPR Ed Three years ago, Grand Rapids' public schools took a hard look at the numbers on absenteeism. They've been able to get nearly half of the students missing school to show up. Mel Atkins grew up in Grand Rapids and worked as a teacher and principal in the western Michigan city. He's now the executive director of community and students for the Grand Rapids Public Schools. Mel Atkins has spent most of his life with Grand Rapids Public Schools in Michigan. He graduated from Ottawa Hills High, where he played baseball. But his real love was bowling. He says he's bowled 22 perfect games. He's been a teacher and principal in the city's public schools. And now he works for the district, overseeing just about everything related to students. One more thing you need to know about him: Mel Atkins is a number-cruncher. Three years ago, the superintendent came to him with a question: Does Grand Rapids have an issue with chronic absenteeism? "I don't think I'd even heard of the definition at the time," Atkins recalls. He looked it up. Chronic absence is defined as a student missing more than 10 percent of the school year — which works out to just two days a month. Research shows that such students are way more likely to fall behind and, eventually, drop out. In other words, you can't teach kids when they don't show up for school. Chronic absence is not just skipping school — it's more likely a mix of truancy entangled with illnesses and family problems. And it's a big problem in the U.S.: It's estimated that more than 5 million students a year are chronically absent. "It was pretty apparent, once we put our data in, that, yes, there is a problem," says Atkins. A big problem. 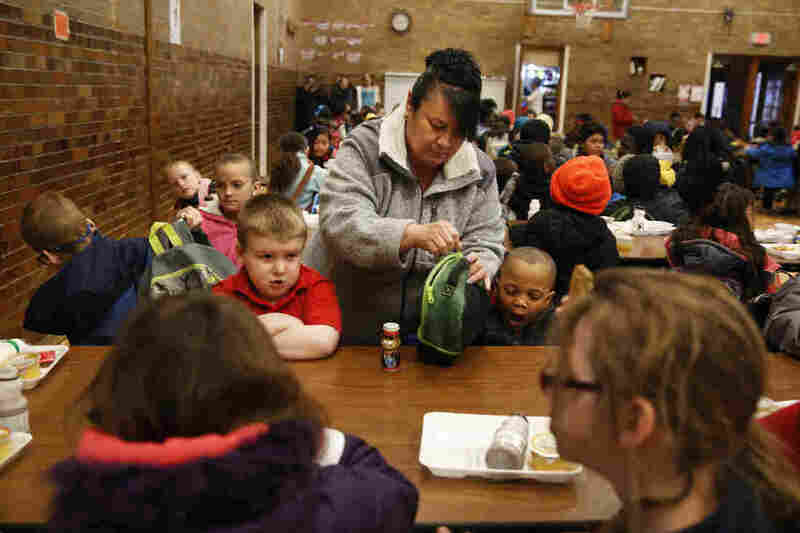 Of 17,000 kids in the district, nearly 7,000 were missing a month or more of school a year. Cyndy Bulson is the grandmother of two of the kids who showed up in Mel Atkins' spreadsheets — a first-grader and his older sister in the second grade. "I really didn't even know that there were problems with the attendance," says Bulson, who is responsible for getting the kids to school in the morning. 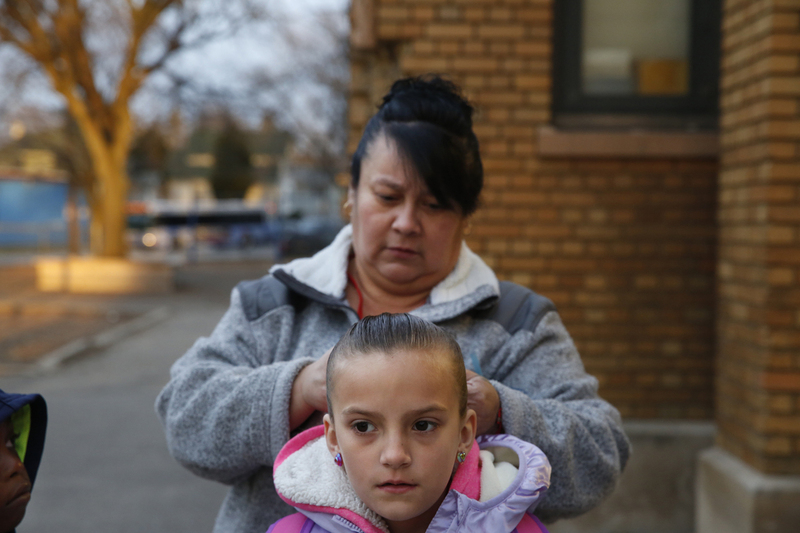 Cyndy Bulson fixes her granddaughter's hair before school starts at Stocking Elementary School. Sure, she says, they missed a day if it snowed, or if they really didn't want to go — but she never counted it all up. "It was one day here, one day there, and all of a sudden it was like, boom!" That "boom" was the school calling in 2014 to tell her that her grandchildren had missed 21 and 26 days of school. Mel Atkins saw this happening all over the district. So he took a look at what other schools did: truancy officers, calling home, rewarding perfect attendance. "We were like most districts," he recalls. "We read a lot of books. We thought we knew what parents needed." So, he and his team launched a districtwide push to get those numbers up. But fast forward a year? The numbers had hardly moved. The yearlong effort had flopped. Atkins, though, kept at it. 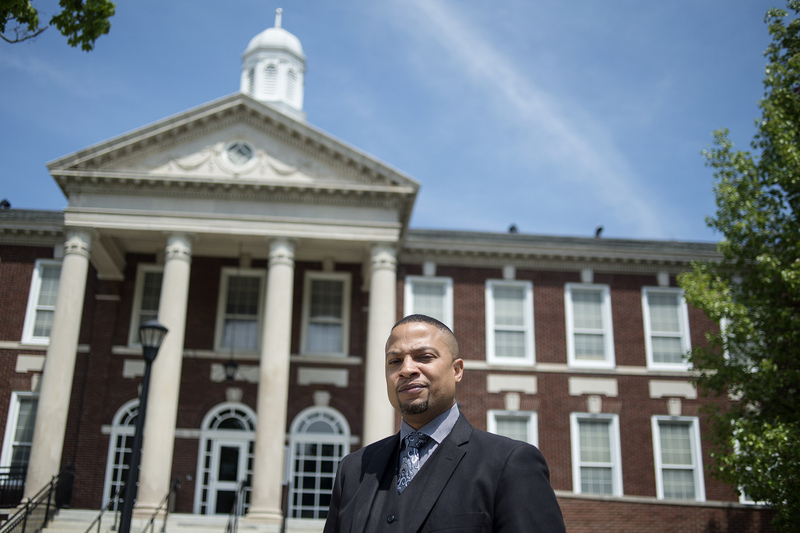 He says he's seen people in education give up when change didn't happen right away, and he was convinced the district could get its children to show up. In his mind, the school district had an obligation. So he and the district's community partners went back to the drawing board. 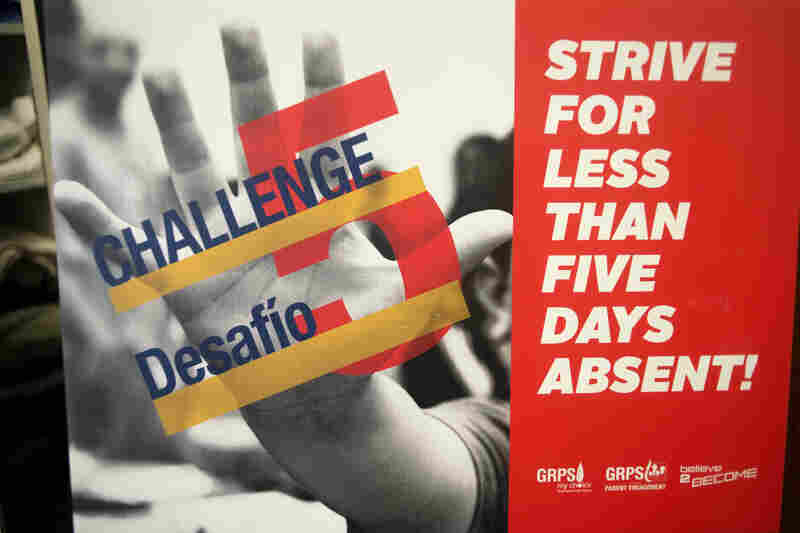 A team working on the messaging landed on a slogan — and a directive: Strive for fewer than five absences a school year. They called it Challenge 5. A Challenge 5 sign hangs in the window of Stocking Elementary School's main office, part of a program to help curb chronic absenteeism in Grand Rapids. It was a challenging ask, to get absences that low. But the message was clear — and folks could throw up a hand and chant "Less than five! Strive for 5." That simple, catchy message, says Chana Edmond-Verley — one of Mel Atkins' key partners — was what helped get the whole city on board. Edmond-Verley is a force in Grand Rapids. She's with the Doug and Maria DeVos Foundation, and Mel Atkins knew that if you want to engage with community partners in this city, she is the one you call. Getting the message of Challenge 5 to the community was her mission — and she used her web of community partners and initiatives to do it. "You got the grandmother on the porch, you got the business, you got the police," she says of the community outreach, "and everybody is lifting up our kids and pointing the way." 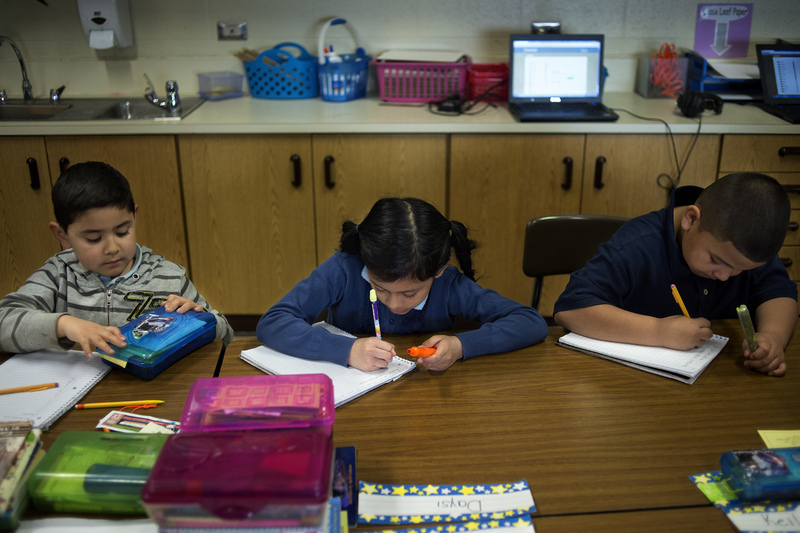 Buchanan Elementary School third-graders work on their spelling. The next thing they did: Get the data out there. Atkins shared the chronic absence numbers with schools — on 8-foot poster boards. When you visit any public school in the city, you can't miss them. They're huge. Atkins gave data to principals, business owners, after-school programs and churches. He printed out a big map of the city so the district and the community partners could see the neighborhoods that were hurting — or needed extra attention. Businesses started putting Challenge 5 signs in their windows. "All of a sudden, things started bubbling up," says Edmond-Verley. The final thing the district did — an idea that grew out of a community meeting — was to create Parent University, a set of classes online and in the schools where adults could learn things, too. 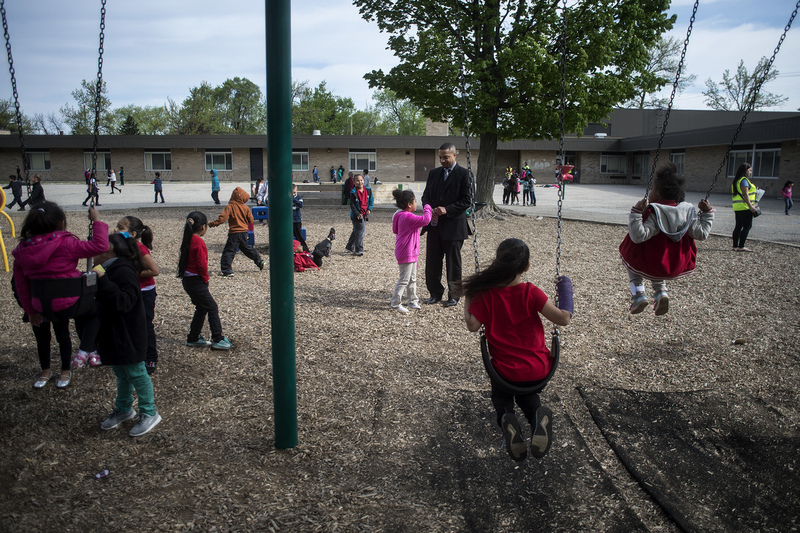 At Buchanan Elementary, on the city's southwest side, Principal Evelyn Ortiz likes to schedule Parent University classes in the morning because many of her parents work the late shift. Mel Atkins (center) talks with a Buchanan Elementary School student during recess. Getting parents in the door, she says, has helped create a culture around showing up. When they come in the building for a class, she has them write their name and the date on a paper leaf, which she pins up on a paper tree in the building's main hallway. Classes at Buchanan cover immigration, computer skills and how to help with third-grade math homework. Ortiz uses nearly every class as an excuse to talk about attendance — and the Challenge 5 initiative. She drags the school's attendance leaderboard — nearly double her height — into a small art classroom for a Parent University class about getting a U.S. work permit. She points out the grades that aren't doing so well, and asks this group of about 10 parents to talk to their friends who have kids in those classes. "How can we create successful students?" Ortiz asks the group, pointing at the board. "This is the first step: making sure they come to school everyday." Cyndy Bulson now volunteers at Stocking, helping monitor kids in the morning, serving breakfast and chaperoning field trips. Cyndy Bulson, whose grandkids were missing so much school, signed up for so many Parent University classes, she earned the title Power Parent. She made friends with other parents, she got to know the staff, and now she's in the school almost as much as her grandkids are — helping monitor kids in the morning, serving breakfast and chaperoning field trips. She says, even if her grandkids weren't in school, "I would be here." Today, nearly three years after Mel Atkins started poking into the numbers in Grand Rapids, more than 3,600 kids who were chronically absent, aren't. That includes Bulson's two grandkids. Just last month, they had perfect attendance. A previous version of this story included a reference to Candy Bulson. Her name is spelled Cyndy Bulson.